The weather seems to be getting hotter. In the heat, it is hard to concentrate and get things done at times. 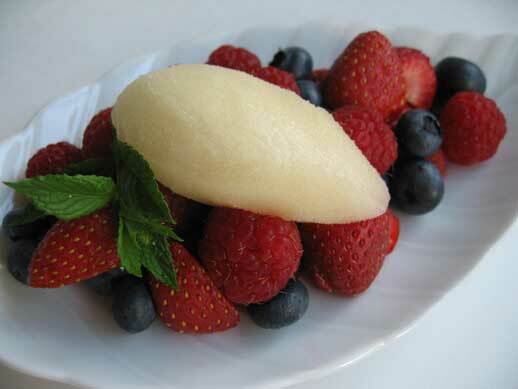 Here is a fresh and simple summer dessert: mixed berries with sorbet. I made a quick lemon honey sorbet for my berry salad. If its too hot or inconvenient, I suggest buying some lemon or raspberry sorbet to spoon on top. Place the sugar, honey and water in a pan, bring to a boil and simmer for 5 minute. Remove from the heat and allow to cool for a while. Juice your lemons. Mix the lemon juice and the sugar syrup together, cover and refrigerate until cold or overnight. Stir sorbet mixture and freeze in your ice cream machine according to the manufacturer’s instructions. Posted by Sam at 3:11 a.m.
Aha! I finally get to look at your beautifully tempting berries on a day when I too am going to be playing with berries in the kitchen. The weather is most definitely getting hotter! Toronto has been a steaming pit for the last week and right now, I could really go for some sorbet and berries. Lemon sorbet with berries sounds absolutely delicious! I'm really enjoying your blog and beautiful photos. Thanks for all your comments. Summer is just such a fantastic time for fruits, berries, ice creams and sorbets. I hope that you are all having a wonderful summer.